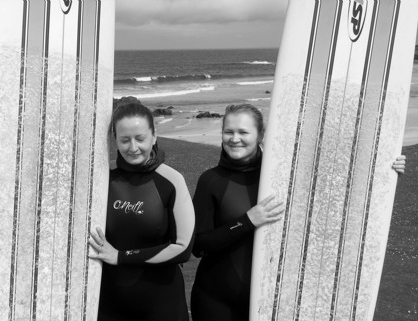 Two young Russian women have been telling how they flew from their home city of Moscow to take lessons in surfing on Tiree. The women. both in their early thirties, have been staying in the Millhouse Hostel while receiving instruction from the staff of surfing firm Wild Diamond. Anastasia Poganova and Alevtina Balushkina, left for home yesterday after spending two weeks on Tiree, but they vowed they would be back.